The Boeriu family poses in front of an old fire truck from Ashley, Ohio. 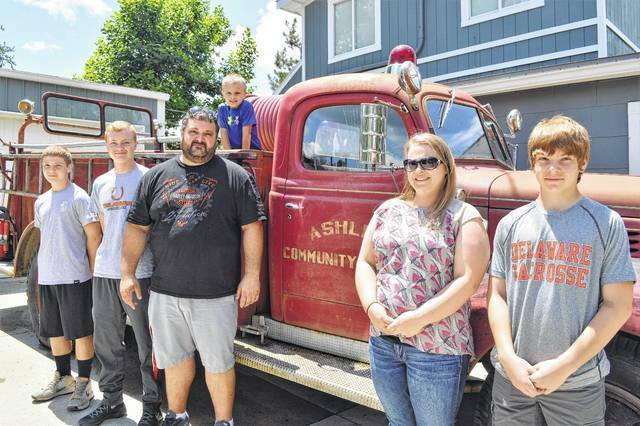 Aiden Boeriu, 13, left, Dominic Boeriu, 15, Erik Boeriu, his wife Aimee Boeriu and Alex Boeriu, 13, stand for the photo, while Nikolas Boeriu, 5, sits on top of the fire truck. Erik is organizing the Fourth of July parade this year after the Delaware County Farm Bureau decided to no longer organize the function. Erik Boeriu couldn’t recall a time when the Fourth of July parade in the city of Delaware had been canceled during his whole life. But it was a potential reality for the parade this year after the Delaware County Farm Bureau notified the city in January it would no longer organize the function. Some residents were informed of the likely cancellation via a water bill in May. “I just can’t imagine Delaware not having a Fourth of July parade,” Boeriu said. He heard about the parade’s cancellation from a friend the Saturday before Memorial Day. By the end of that same week, Boeriu was in charge of the parade. Fellow Delaware residents Corie and Ben Thompson have teamed up with Boeriu. They created a group called Citizens for the 4th. “We’re going to keep it the same as in past years,” Boeriu said. But the group has had less time to prepare for the parade compared with its predecessor. This year’s parade will have about 30 entries plus walk-ins, if any. Chuck Davidson, a Vietnam War veteran, will be the parade’s grand marshal. Citizens for the 4th will also continue to ask parade entrants and attendees to donate non-perishable food items for People In Need. “I think as a city we need to donate more to People in Need,” Boeriu said. Cathy Dawson spearheaded the Farm Bureau’s efforts for the last five years and was one of the grand marshals of the parade during that time. Her parade preparations started in late February. Dawson would then accept parade entries at the beginning of June with 50 to 75 participants annually. The Farm Bureau decided not to organize the parade this year in order to focus its efforts on engaging the community in a wider variety of agricultural topics, including supporting local FFA chapters, providing grain bin rescue equipment to area fire departments, and water quality issues, said Steve Berk, the organization’s director. “Delaware County Farm Bureau is extremely appreciative to have been given the opportunity to organize the parade for many years. We want to personally thank Doug and Cathy Dawson, who volunteered countless hours to help make the parade such a success. Their leadership made the parade a highlight of the summer,” Berk said. But the Farm Bureau did not end its organization of the parade without some controversy. Some parade entries displayed the Confederate flag in last year’s parade. That prompted backlash from some residents towards the county and the city, both of whom said it was organized by the Farm Bureau. Dawson and the organization were both disappointed the flag was displayed in the parade. But no one noticed the flags when the entries lined up, she said. “That’s all in the past now,” she said. Dawson, who provided Boeriu parade-related contacts, said she hopes the new organizers will have a successful start. “Hopefully they’ll have the same turnout that we always did,” she said. The new organization will have the right to bar any parade entry, Boeriu said. He said about 15 volunteers to police the parade lineup before it leaves the fairgrounds. “We’ll see how everything goes,” he said. The parade is scheduled to begin at 3 p.m. on Tuesday. Units will line up at the Liberty Street gate of the Delaware County Fairgrounds. The route will follow Pennsylvania Avenue east to Sandusky Street, then proceed south on Sandusky to Wilmer Street, then east on Wilmer, and conclude at Selby Stadium.